Hanover, VA – The Hanover County Sheriff’s Office would like to remind citizens to protect themselves against identity theft and scams. 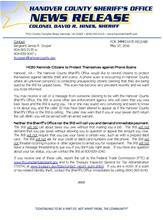 A phone scam is reoccurring in Hanover County where an unknown person(s) is contacting unsuspecting citizens claiming that they are being sued by the IRS for unpaid taxes. This scam has become very prevalent recently and we want you to be informed. You may receive a call or a message from someone claiming to be with the Hanover County Sheriff’s Office, the IRS or some other law enforcement agency who will claim that you owe back taxes and the IRS is suing you. He or she may sound very convincing and seem to know a lot about you, and the caller ID may have been altered to appear as if the Hanover County Sheriff’s Office or the IRS is calling. The caller may warn that if you or your lawyer don’t return the call ASAP, you will be served with an arrest warrant. Neither the Sheriff’s Office nor the IRS will call you and demand immediate payment. The IRS will not call about taxes you owe without first mailing you a bill. The IRS will not demand that you pay taxes without allowing you to question or appeal the amount you owe. The IRS will not require that you pay your taxes a certain way, such as with a prepaid debit card. The IRS will not ask for your credit or debit card numbers over the phone. The IRS will not threaten to bring in police or other agencies to arrest you for nonpayment. The IRS will not leave a message threatening to sue you if you don’t pay right away. If you have any question about your tax status, you can contact the IRS at 800-829-1040. If you receive one of these calls, report the call to the Federal Trade Commission (FTC) at www.ftccomplaintassistant.gov and to the Treasury Inspector General for Tax Administration (TIGTA) at www.treasury.gov/tigta/contact_report_scam.shtml. If you are a victim of a scam or tax-related identity theft, contact the Sheriff’s Office immediately by calling (804) 365-6140.